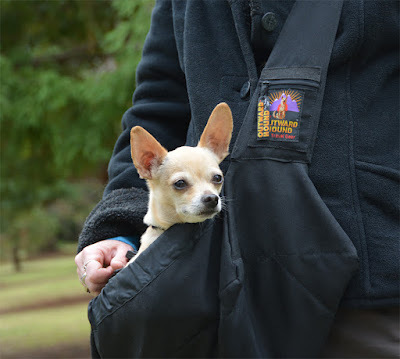 The Outward Hound PoochPouch Sling is a cross-body bag for your small dog, cat, ferret, chicken, bearded dragon, or whatever else you'd like to keep right at your hip. The pouch measures 23" long, 13" wide, and 3" tall. It has a harness clip inside, as well as a buckle across the middle to keep the long sides from flopping open. The shoulder strap is adjustable and has a quick-release buckle. My PoochPouch Sling is black, I've also seen them in blue. This is a very basic, utilitarian dog-holder that I find to be neither stylish, nor terribly functional. The bottom is not rigid at all, so the dog has no secure place to rest their feet. The pouch is long and shallow, and even with the gathered sides it's a bit difficult to keep Ru from flopping out. The chunk plastic harness clip is too big for the hardware on a lot of toy breed gear. That said, it's better than nothing. If public transport rules require you to carry your pet in a bag, this will do. It's quite a long pouch, I can even fit 30 lb. Sisci in it with some effort. Pros: Fits larger-size pets than most carriers. Wide shoulder strap distributes pressure. Basic black no-frills sling does not attract attention to the fact that you're schlepping something alive. Cons: Requires a fair amount of cooperation on the part of the occupant. Low sides and floppy construction mean I don't feel safe using this as a hands-free dog carrier. Bottom Line: I can see this carrier being useful to someone, somewhere. I already have entirely too many Ru-holders, however, so will be passing this along.